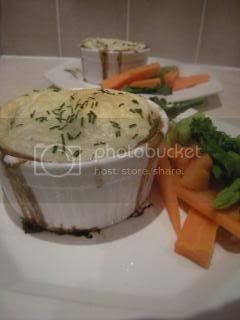 Nothing can beat a pot pie on a cold winter’s night, and these are fabulously warming. Easy to make too, as long as you have a little time up your sleeve. I’m a big fan of putting these on in the late afternoon, and letting them simmer while you run around like a mad thing, until – voila! – you pull them out of the oven ready to eat. Beef and red wine are popular partners, and it’s easy to see why – they complement each other perfectly. 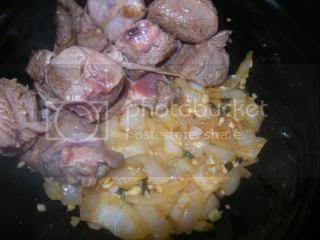 Add some garlic and fresh herbs into the mix and it’s really quite difficult to go wrong with it. You can do a whole range of things with these. I’ve only just developed this recipe, but I’m tempted to add carrots to it, baby carrots would be just divine. 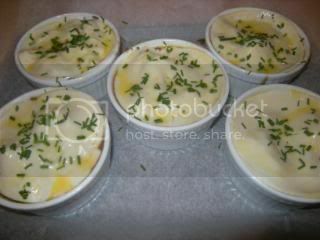 You could also top them with mashed potatoes (a la Shepherd’s or Cottage Pie) and some grated cheese, and brown them off in the oven. They would also work really well as a fully-encased large pie, too. Try them, see how you go with it, don’t be afraid to experiment. And remember to let me know how it turns out! 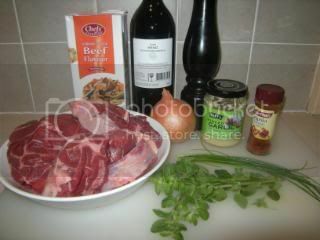 Pretty simple, really: Gravy beef (which is butcher-speak for cheap, sinewy, beef – I’ve used just over a kilo); beef stock; dry red wine (this is a cleanskin Shiraz); a large brown onion; cracked pepper; minced garlic (or 4 finely chopped cloves); paprika; and some fresh herbs (I’ve got marjoram and chives here, but parsley (either curly or flat-leaf) would also be nice if it’s going spare). 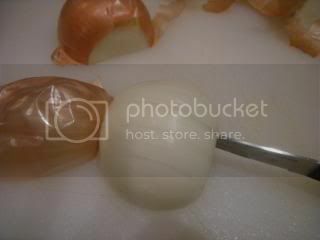 Because so many good things start with chopped onions: lop the top off, cut it in half, and peel the skin back. We’re going for chunky, so cut it into about 1cm wide strips, leaving the base intact. Cross-cut slightly narrower, to form a moderately chunky dice. 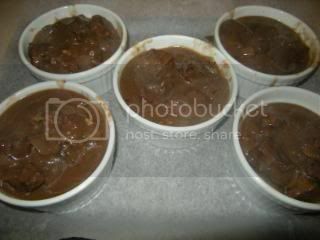 Dice the gravy beef up into chunks to suit your ramekins. Mine are probably a bit too large, as my ramekins are quite small, but be guided by your hardware, and your desires. We’re doing everything in one pot, so grab a largish one and slurp some oil in. Put it over medium heat to warm up. 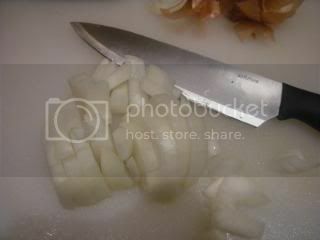 When the oil is warm, drop in the onions and stir them around a bit. 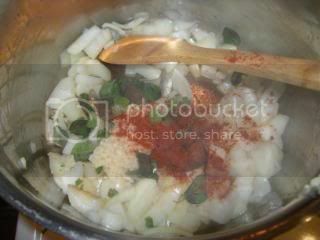 Then add in the garlic, the paprika, and the ground pepper. I’ve haven’t bothered chopping up the marjoram, I’ve just pulled the leaves off the stems (which are quite woody, so you don’t want them in), and thrown them in too. 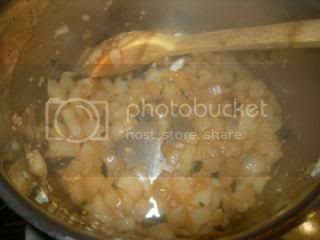 Stir it all around, and when it starts to smell good and the onions are nearly done, put them aside in a bowl. 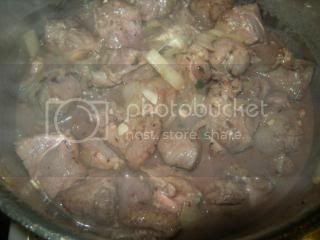 Brown off the meat in small batches. 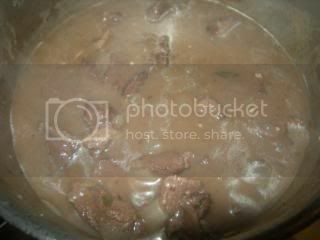 You might find you’ll need quite a few batches to get through it all, partly because there’s a lot of meat there, and partly because we’re using a saucepan with a narrower base than usual. You don’t need to brown them much though, just enough that they pick up some colour from the bottom. 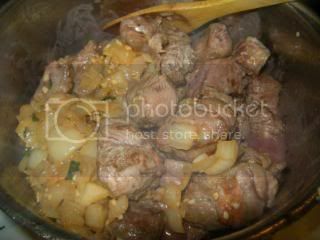 Put each batch aside as with the onions as you complete it. At this point, I would usually recommend butter. 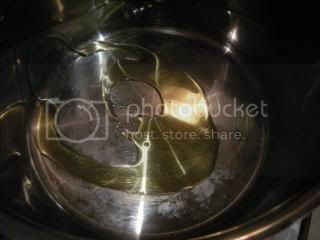 That said, I’ve got some bacon fat put aside from bacon and eggs on the weekend, so I’m going to use that instead. 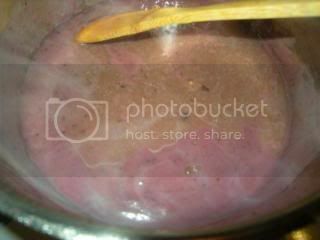 You want a pretty good scoop of the stuff – around 50-100grams should be good. 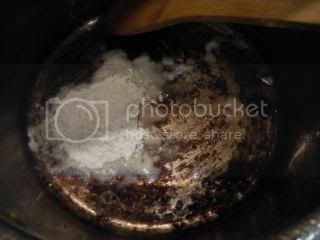 See how lovely and grotty our pan is? 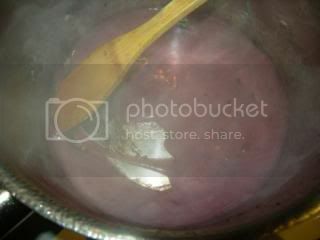 We’re going to create a roux with the fat and some flour, and bring all that flavour into our pies. 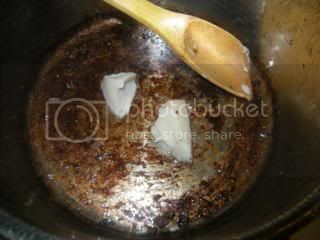 Turn the heat down as low as you can, and drop the fat (or butter) in to melt. And mix it all up. 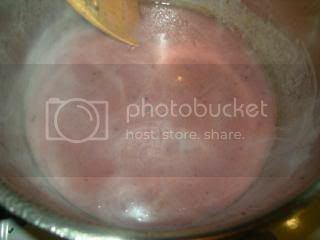 It should bubble a little bit, and then start to thicken. 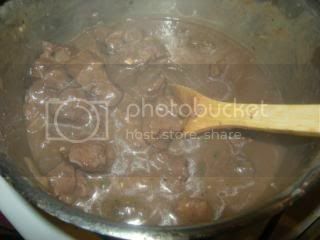 As soon as it starts to thicken, throw a slug of the red wine in – about a quarter to a half a cup. 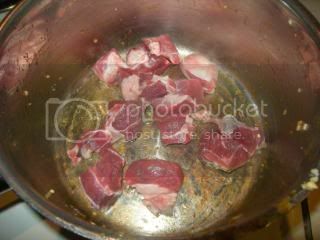 Give it a slug of beef stock, stir it all around, let it thicken up again (getting good at this yet?). It should be more or less runny now, so let’s start adding everything else back in. Chuck in the onions and the beef. 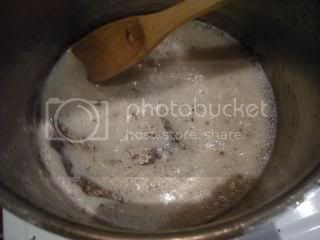 Stir it all through the gravy. Now put the lid on and walk away for at least an hour. Preferably two or more hours. The longer the better, really. 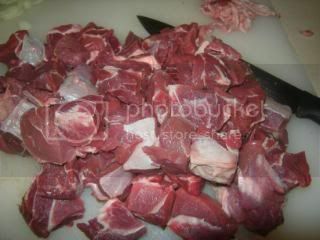 We want the sinew in the beef to completely break down. Test by pulling out a piece and biting into it. Your teeth should meet no resistance whatsoever, and the meat should fall apart in your fingers. 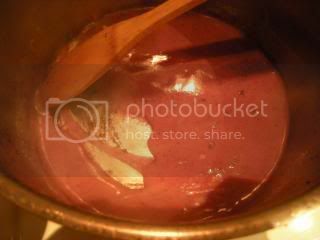 If you end up with quite a lot of gravy, take the lid off, turn the heat to medium, and let it simmer off. If you’re running out of time, or if you’re impatient, you can always throw a little bit of instant gravy powder in to thicken it up. 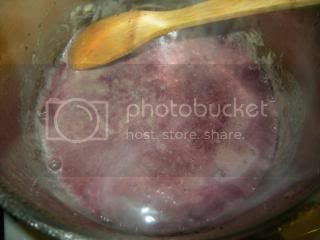 I would avoid this, personally, because it adds a lot of salt to the dish, which overpowers the wonderful combination of the red wine and the herbs. It works well in an emergency though. Turn your oven on now to preheat at around 200 degrees. 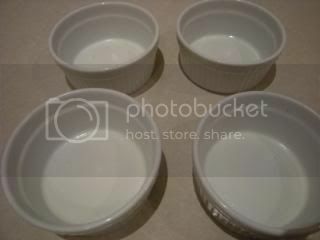 Find your ramekins, and give them a light spray with whatever oil you have in a can. I’ve only got four in the picture here, but I ended up with enough filling for five. Cut circles out for the lids, using whatever you have that is the right size. 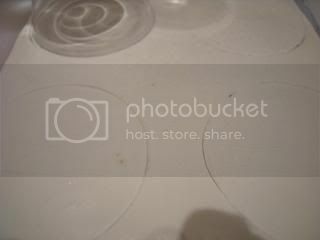 For me, it’s a wine glass, which is the shadowy thing in the top left corner there (rotten photo!). Here’s our filling, ready to go – don’t be worried if you still have a lot of gravy, it will thicken up some more in the oven. Also, the joy of pot pies is that consistency is not too much of a problem, as the pot holds it all in quite nicely. 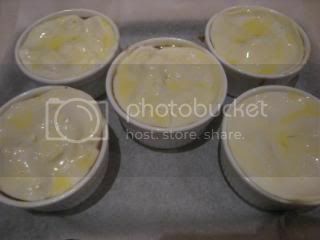 Grab a biscuit tray, line it with baking paper, and stick the ramekins on top. This is to catch spills. Fill your pots up evenly, with about half a centimetre gap at the top, to avoid them overflowing (mine always do anyway). Put the pastry tops on and give them a brush with some melted butter. I’ve sprinkled the chopped chives over the top, but you can do what you like to gussy them up. Then stick them in the oven for about twenty minutes at 200 degrees. 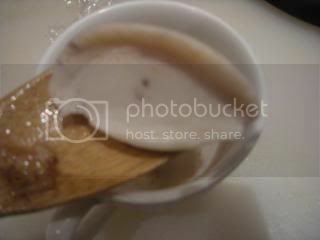 Remember that they’ll need to go on a plate or in a bowl to be served, as the pots will be very hot. Warn any small people to blow! 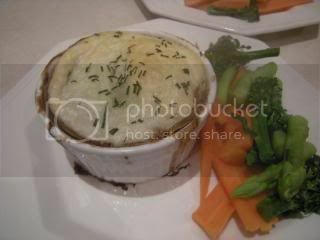 I like to keep it simple with pot pies, and just serve some steamed vegies on the side. Done! 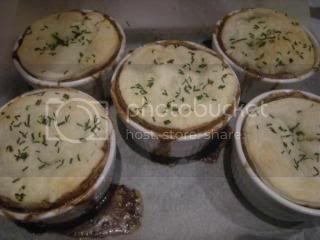 Pictures are in the Beef and red Wine Pot Pies Photobucket Album.